As January comes to a close, here at Snake Out Brisbane we’re still celebrating how we started! The first six days of the year gave us six elapids in a row. 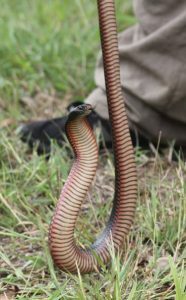 An eastern brown snake (Pseudonaja textilis) on the first, a red-bellied black snake (Pseudechis porphyriacus) on the second, a white crowned snake (Cacophis harriettae) on the third, and then another three brown snakes on the fourth, fifth, and sixth. The red-bellied black was one we spotted cruising along the bitumen on a road west of Brisbane. We quickly (and safely) pulled over and tailed the beastie before it could get the smoosh treatment from oncoming traffic, and released it in the direction it was already heading. The rest were call-outs, with the last brown snake a particularly tricky one, having ducked underneath the clients house just before we arrived! A great way to kick off 2018 and hopefully a good sign for the rest of the year!